Today, the majority of Small Island Developing States (SIDS) rely on imported diesel fuel to generate electricity on the islands. This reliance on diesel exposes SIDS to multiple challenges. First, the fuel must typically be transported great distances at great expense and the resulting electricity tariffs can be staggeringly high. In 2010, for instance, when global oil prices were higher than they are today, some Pacific SIDS reported tariffs above $1.00 per kilowatt-hour —roughly 10 times the average price in the United States. SIDS’s reliance on diesel presents serious energy security consequences as well: when oil prices spike, SIDS’s utilities can find themselves unable to afford the fuel needed to keep their generators running and severe weather events can make it impossible to deliver fuel. Finally, as part of their efforts to demonstrate leadership in international climate negotiations, many SIDS have set ambitious renewable energy targets that are at odds with their continued use of diesel. Solar powered microgrids appear to offer a significant opportunity for SIDS to lower their electricity costs and improve their energy security, while also advancing their climate objectives. The cost of solar photovoltaic (PV) installations has fallen dramatically in recent years. The costs of battery storage systems, which make it possible to integrate high penetrations of PV without jeopardizing reliability, have dropped significantly too. In light of this progress, and the extremely high cost of fossil generation on SIDS, the case for transitioning to solar power should be clear. Yet, thus far, relatively few islands have made the switch. On October 1, 2015 the Guarini Center on Environmental, Energy and Land Use Law at New York University School of Law (NYU) convened a daylong workshop to examine the extent to which solar powered microgrids could help SIDS achieve their energy goals, and to explore strategies to overcome obstacles standing in the way. The workshop, which was co-hosted by SolarCity, provided a chance to conduct detailed conversations with representatives from the national utilities of the Cook Islands, Palau, the Republic of the Marshall Islands, and the Seychelles about their islands’ power sector and policy goals. Experts from the international development community, including the World Bank, the Asian Development Bank, and the United Arab Emirates’ Ministry of Foreign Affairs, the Clinton Climate Initiative, Rocky Mountain Institute, Carbon War Room, and various academic commentators lent their perspective to the conversation as well. The workshop indicated that there is indeed a compelling economic case for SIDS to move away from fossil fuels, towards systems in which PV plays a major – if not dominant – role in generation. In fact, modelling presented at the workshop indicated that adding at least 35% PV to the generation mix would lower the cost of producing electricity on each of the six islands examined. On half of the islands, data indicated that the local utilities could add over 90% of PV to the generation mix and still cut costs. Part I of this report presents an overview of the relevant case studies, including the modelling assumptions used. 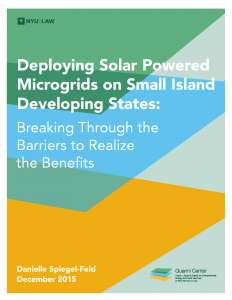 Despite the great potential microgrids hold, the workshop also revealed a number of challenges that need to be overcome before SIDS can reap the full benefits these systems offer. The “Top Ten” such challenges, and potential strategies for overcoming them, are presented in Part II below. It is our hope that this document will help guide other SIDS that may be considering adopting solar powered microgrid solutions in their territories….